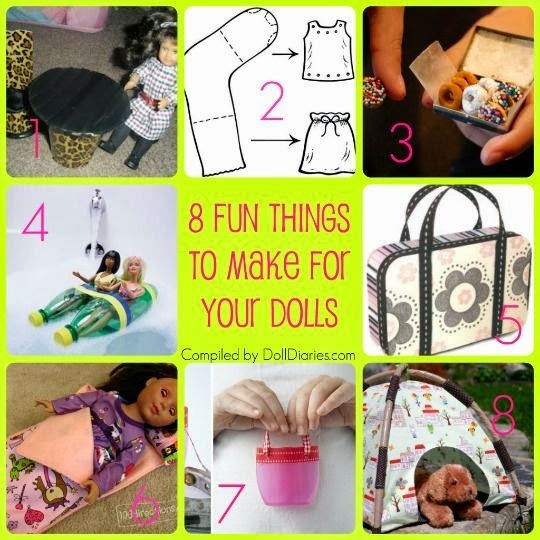 thought it would be fun to "connect" with "Craft Month" one last time and give you a link I found on Pinterest for 8 Fun Things to Make For Your Dolls! Follow this link and you'll find 8 fun crafts for American Girl dolls! So, how can you get in on the give-away for Isabelle which will be on May 24, 2014? Just follow these steps . . .
You will receive one entry each time I post about Isabelle if you comment; for example, you will receive one entry this time if you comment to let me know which craft looks like something you might try; I think the luggage and tent looked like fun! You will also receive entries each time I post if you share the post - one entry for each share, but you need to comment to let me know if you share so I can be sure you receive all your entries. This is where some of the confusion is coming from. You are welcome to share via facebook, twitter, google + and pinterest, but this would be limited to four shares per post - not every day sharing these four ways again, but four shares per post. I have had some people share multiple times per post every day; which meant literally hundreds of shares. I am honored to think you would go to the time and effort to share this much, but I can only count four shares per post. You will also receive a one-time entry for each way you follow grandma's cookie jar - one for following on facebook, one for google+, one for following by email, one for twitter and one for pinterest - a maximum of five per post. Please comment to let me know which ways you follow grandma's cookie jar so I can give you your entry for these as well! Thank you for reading grandma's cookie jar and for sharing it with the people you know! I look forward to letting you know all about Isabelle . . . and to ultimately giving her away! It's my birthday, month, too. In fact today is my birthday! I follow you on Feedly and Facebook. I am a crafter, so I might try more than 1. I think the first one would be the little purse. Thanks for the chance to win! I like the tent and sleeping bag craft ideas. These are great craft ideas to do with my girl scout troop. I follow and I shared via facebook, twitter, google + and pinterest. love them all but the sleeping bag looks like something I could definitely do. I love the doughnuts! I love to craft doll food and I think next I'll make doughnuts similar to those. I like the tent the most.....! I like the little purses. I follow on fb and email. Liked, shared on Pinterest & FB. Follow FB, email, Google+, pinterest. I think I'm going to do the doll sleeping bags for when my daughter has her 1st sleep over birthday party this year and let the doll sleepover bags be party favors - Thank you for sharing these cute ideas. We love to do crafts for the dolls. Thanks for the link -- we have a long weekend coming up. I like the little purse. I once made cute hobo style purses for my girls' American Girl dolls. I follow by e-mail (under a yahoo account), facebook, twitter, and Google+. I think I'll have to try the sleeping bag. :) btw, how would I follow you by email? My preferred email would be pudininpie (at) yahoo (dot) com. Most likely I'd try the sleeping bag. Would love to win this for my daughter. She has always wanted an American Girl doll! The luggage is a great idea!